Hotchkis Trailing Arm - Pann Auto Performance - San Diego largest aftermarket automotive performance parts - What do you drive? 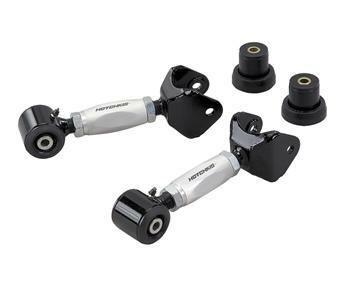 Improve the traction and handling of car with the Hotchkis Double Adjustable Upper Trailing Arms. These exceptionally durable control arms allow for easy pinion angle adjustment for reduced vibration and increased traction. Our exclusive Swivel-Max bushings offer non-binding articulation during suspension travel, which improves traction and rear suspension efficiency. Finished in gloss black powder coat and clear anodizing, these Double Adjustable Trailing Arms look great and perform well. This item is a must for any high horse power models.